bird watching | Nature is a Language - Can't You Read? Any dedicated followers of this blog, my twitter feed or those I know personally who have the misfortune of enduring my excited ramblings about birds you will know there’s one bird that I tend to hold in more high regard than others, one bird that I want to see the most. The male smew! I’ve seen female smews on a couple of occasions so this is goes beyond just being able to “tick a bird off”. The smew in my opinion (and it should be yours too) is the most fantastic looking ducks there is. With its Billy Idol quiff and cracked ice plumage it’s the sexiest duck you will ever see. 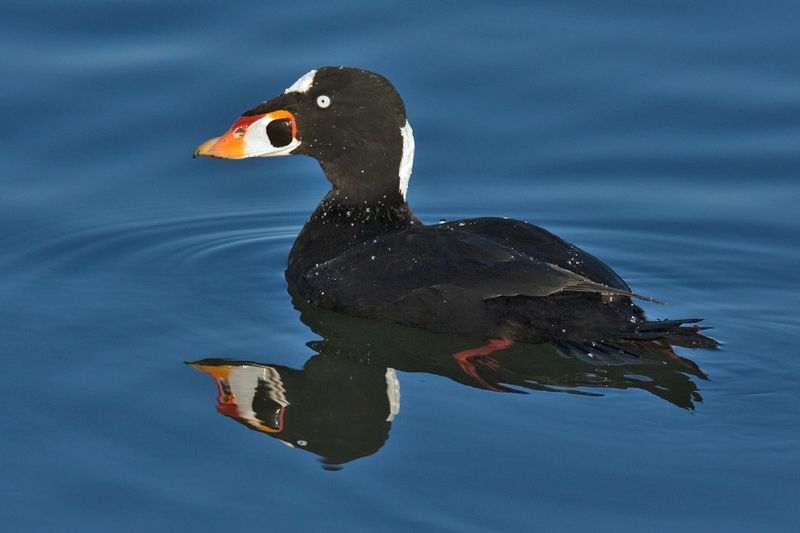 Some people say that the Harlequin duck is better looking than a drake smew, however these people are wrong and should see a mental health professional. Whilst checking facebook last night I saw that Erich had updated his blog with news of there being two drake smews present at Welton Waters / Brough Angling Complex. With two present there stood a good chance of one hanging around. I was undecided whether to try for it but decided that I’d pack my binoculars and see how I felt after college. I dreamt about smew last night and I nearly fell out of bed twice. Upon arrived at college and on the news of my class being cancelled, I went to the library constantly checking RBA for updates on my phone. After doing a bit of work I decided I had earned the chance to go see if I could find the handsome devil and got on the train to Brough. Walking along the flood defence at Brough Haven, there was a great number of fieldfare around but little else around. A pheasant made the first year tick of the day. At the angling complex I checked the main pound and all I could manage was goldeneye, wigeon, gadwall and coots. After waiting a while I moved on to Welton waters. As I walked past the sports lake, I saw something with a white front dive into the water. Erich had reported a Red-Throated Diver with the smews however I couldn’t relocate and two cormorant swimming around it looked like I had been over hopeful! A kingfisher flew across the lake. As I made the walk back along the lake I heard a lot of rustling and noise coming from the reeds around the lake. I waited for a while and was rewarded with my first ever glimpse of an otter. Mustelid heaven! Walking back I noticed that there were three birds diving and as I got closer I was glad to see that I hadn’t been seeing things and the Red-Throated Diver was still present. Lifer! I watched this loon for a while before moving back to the angling ponds. Despite knowing roughly the size of smew it’s surprising at how many birds with bits of white on them get your hopes up even if they’re about twice the size! I waited and scanned across the pond and it wasn’t long until I finally found the holy grail of my birding! Trying to contain my rebel yell of excitement I watched the smew until the couldn’t handle the cold anymore and decided to head back. Fifteen minutes with smew, well I wouldn’t say no. The walk back gave me another year tick of a pair of linnet. Here are my top ten birds of 2012…. I’m a big fan of grebes however had only seen little and great crested so when three black-necked grebes turned up at North Cave Wetlands I decided that instead of heading to the library to do important college work that I would travel down to one of my favourite nature reserves. Well worth it. Often heard but never seen. After a disappointing trip to a high water levelled Filey Dams we headed off to Bempton Cliffs. A cuckoo had been seen on the concrete posts that fence off the MoD land. It didn’t take long to locate and stayed still most of the time with the only movement flying from one post to another. Great to get such brilliant views of a bird I can rarely locate. My first garganey and my first self-found rare bird too! Cracking little duck. In august I went on an awkward lunch date. Afterwards in a bid to rid myself of the shame I went birding and saw my first ever hobby! You know you’ve seen a good bird when you mutter “f**king hobby!” to yourself when you see it! Hold the revolving door! 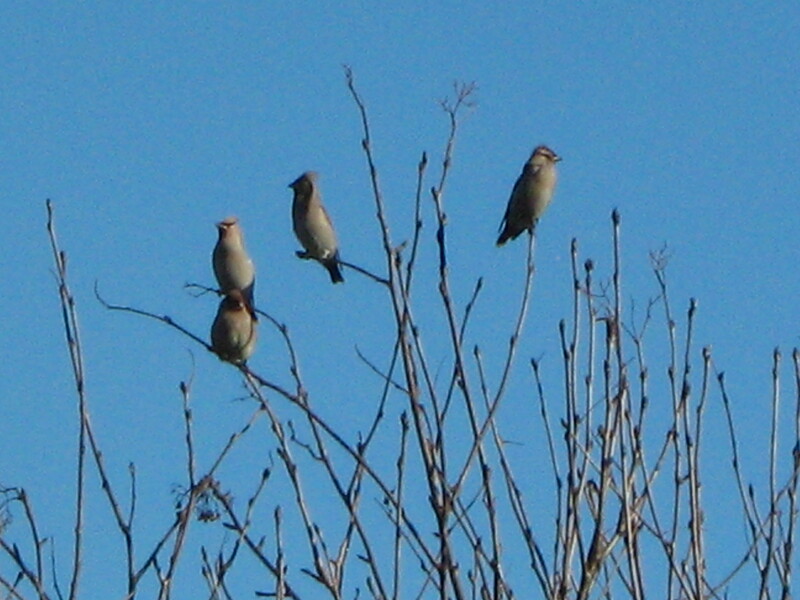 Waxwings only at number five? What is this madness?! It’s been a good year for top birds so much so that the avian Jedwards have been knocked back into fifth place. They crop up in your dreams , oh but dreams have a knack of just not coming true. However this year was different and I managed to catch up with them as my last post shows. They also turned up in Hull behind St Stephens shopping centre, but unfortunately I was in a class when the alert came through on RBA android app and I spent an agonising hour and a half waiting for my lunch break to see if I could see them (sadly I didn’t). I didn’t renew my trail RBA subscription to save me from the hell of not been able to shoot off for a bird, for now anyway. New Year’s Day 2012 I saw two short-eared owls hunting then a ringtailed Hen Harrier appeared trying to steal food from the hunting owls. It was hard to follow where all three birds were at times and who was stealing from who, but it was a “spectacular” as some would say. After seeing these three birds there was a total down pour and I had to walk an hour home soaking wet. Was still worth it! My first proper twitch to go see the long staying and most photographed bird. Hung around on the cold cliff tops at Bempton waiting for this little cute thing to pop up. Was well worth the wait. Didn’t get a photograph as there’s already a million of it on the web! That same day I also made friends with a one footed turnstone, saw my first gannets of the year some four months earlier than I usually do and saw some harbour porpoises. My second proper twitch to another bird that stayed around for a while. Parked up, waiting in the cold drizzle for an hour (luckily some friendly birders were present for company) eventually it turned up in on some over head wires and I got to see its vivid blue colouring and lovely cinnamon pink back. Watched it for half an hour and then had to go to work, but I went to work very happy! Close calls – Iceland Gull (I like gulls but not enough to make them to the top 10), Smew – female only a male would have found its way into there. That’s the type of sexist pig I am. Peregrine – same day as the cuckoo. I had fantastic views of a juvenile female calmly sat on the cliffs at Bempton. Greenish Warbler, cute little bird but too didn’t want to feel too much of a twitcher by counting it ;), Golden Plover – incredibly cute, Wood Sandpiper, Temmincks Stint, Little Stint, Bar-Tailed Godwit – The Swinemoor highlights, Brent Goose – probably my favourite goose! I finished the year with 144 birds, bit disappointing seen as I had 90 in February however I’ve done very little birding since the summer. Missed out on going to see the Jack Snipe that was present for a long while at North Cave Wetlands, no green woodpecker sadly. Dipped on Barred Warbler, Yellow-Browed Warbler and Red Breasted Flycatcher whilst at Spurn. Also missed out on a Pectoral Sandpiper on Swinemoor and when at South Landing found a Spotted Flycatcher but didn’t see the Pied fly, at least I didn’t see it and get disappointed when it turned out not to be an Atlas though! Hope 2013 is more successful and full of even more fantastic lifers. They’re here and once again in style! 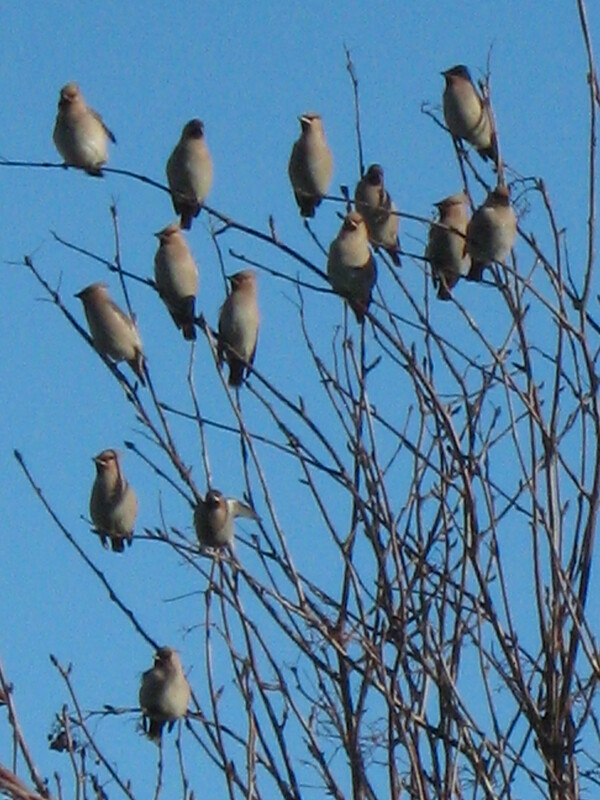 With their wonderful quiffs and high trill calls waxwings are the Jedwards of the bird world. Getting their name from the red wax like drips on the end of their wings there aren’t many people who don’t love these winter invaders. It’s a bird I always hope to catch up with and often dream about during the winter months! 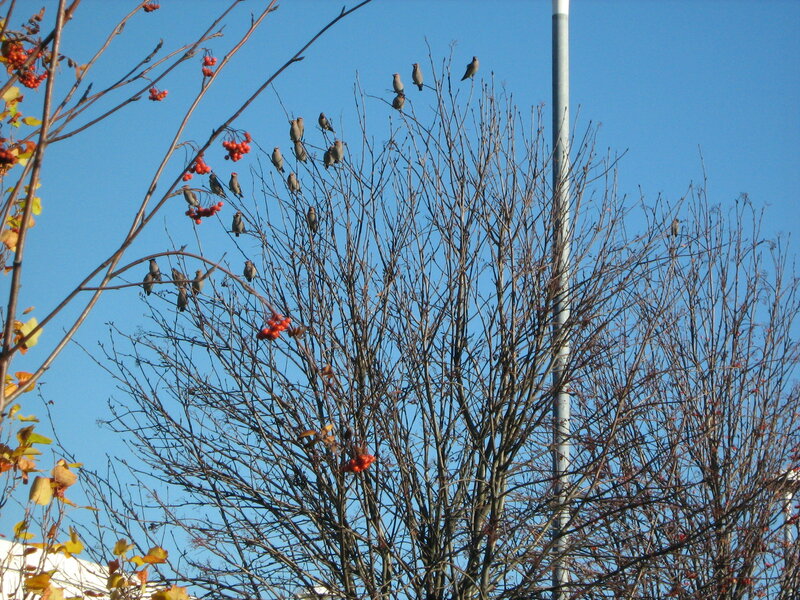 News started coming in about a large flock of waxwings in the car park at ASDA Hessle Road on thursday night. Unfortunately I was working Friday and Saturday so the earliest I would get out there would be Sunday morning. I made a few enquiries on twitter and the large flocks were making work of the berries. It didn’t look good, most likely to move on before Sunday. I decided now was the time to download Rare Bird Alert app on my phone and use the free trial. With alerts set up for waxwings my hopes were raised on Saturday when I got an alert saying there was still a flock of 300 late evening. We woke early on Sunday morning and got the first bus into Hull and then after a cold short wait watching very cute sniffer dogs making sure Ferensway would be safe for the service of remembrance we got the first bus to Hessle Road. Whilst we waited for our bus I got an alert saying that 200 had been seen at 8:26 am, things were looking good! Arriving at ASDA we soon found people in the car park with big lenses so decided to go and wait with them. After standing around for about ten minutes getting excited at every flock of starlings that flew over two birds flew over with pale underneath. 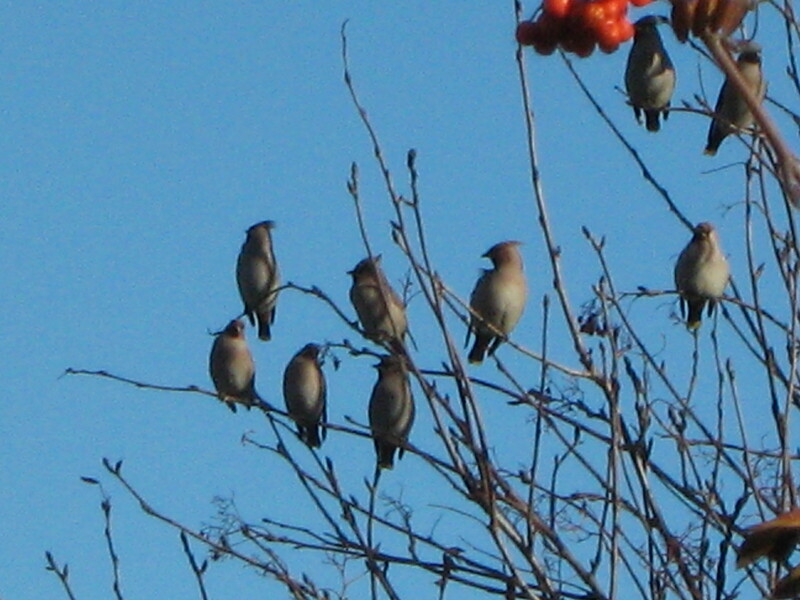 These were soon located on a tree at the other end of the car park, bins went up and these were waxwings! Tried pointing out to my daughter, however trying to direct a five-year old to a single bird in a far away tree is hard work! A kind photographer showed her a picture he had taken however. After looking at the two waxwings for a few minutes we decided to go warm up in the now open ADSA and get some breakfast inside us. After our breakfast we went to see if anymore waxwings had turned up, sadly not. We decided to walk around the local area seeing if we could local the large flock from earlier. Soon the child did as children do and needed the toilet. Whilst her mother took her I stood outside ADSA waiting when a large flock of waxwings came in and landed on a tree next to the bus stop on the opposite side of the road. They then moved to the proximity of the snappers and we caught up with them and took some photographs using our compact camera. This time even my daughter managed to see them and successfully completed her first twitch! Soon it was time to go wait for our bus and as we waited the flock came back to the tree next to the stop to once again give us some cracking views!